Willows restaurant enjoys a second life on Hausten Street. Their slogan is "Hawaii's Original Garden Restaurant Since 1944" and that pretty much sums it up. Located at 901 Hausten St. in Moiliili, the restaurant was one of the early "theme" eateries, decorated in a lanai style that incorporates an inside-outside ambiance with plenty of plantings and wicker furniture. It's an oasis in a semi-industrial neighborhood, and became a Hawaii Visitor's Bureau site due to it's insular appeal to Hawaiian tastes. The site was one of those magic spots of ancient Hawaii, Kapa'akea Springs, which, by the 1920s, was the home of Emma McGuire Hausten. The family gardens featured willow trees as will as Hawaiian medicinal plants. A popular spot for neighborhood luau, Hausten's daughter Kathleen McGuire Perry formally opened the restaurant during the war years. It was bought by Randy Lee in 1980 and, thanks to a bursting-bubble economy in the early '90s, closed for a time. In 1999, with the property now owned by the Weinberg Foundation, the restaurant reopened. The once-quaint thatched dining kiosks were replaced with more modern (and less flammable) open-beam construction, with a wedding chapel, art gallery and banquet room added to increase the sales mix. A mechanical pump spring replaced the once-natural spring that petered out long ago and a miniature volcano erupts with red lights. 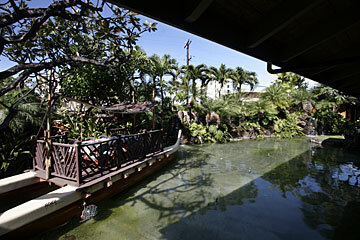 More importantly, The Willows has waterfalls, fish ponds and a buffet-style restaurant that still attracts locals and visitors. When the restaurant reopened in 1999, nearby residents complained bitterly. It seems they didn't want the street blocked with the expected limousines. Operators Garrett Kamei and Kyle Nakayama, working with Weinberg's Honolulu Ltd., acquired several parcels of land around the restaurant for additional parking. More recently, the upstairs Rainbow Dining Room was converted into a EuroAsian a la carte restaurant named J's at The Willows, and traditional Hawaiian music has been supplanted by reggae and blues.